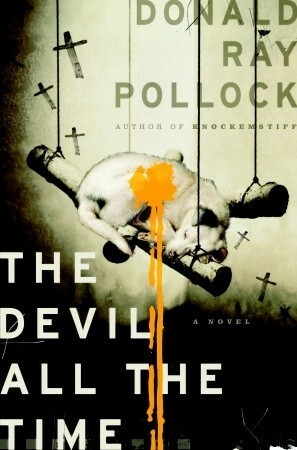 Even though this is only my second time reading Donald Ray Pollock, he’s quickly becoming one of my favorite writers. He continues to create such interesting casts of characters, and this one’s is no exception. This book is very much in the same vein as his first volume of short stories, Knockemstiff–poor, rural people in desperate situations. This book’s got a little bit of everything: a man who sacrifices animals and other roadkill to rid his wife of cancer, along with his morally conflicted son, who’s willing to sacrifice everything for a sense of peace. There’s a spider-eating preacher and his guitar-playing sidekick who are convinced they can raise people from the dead, and a murderous husband and wife duo that pick up male hitchhikers, torture and photograph them, and kill them. The beginning of this novel starts off strong, but I had to admit that by the middle of the book I was a little hesitant to continue because wasn’t sure where this book was going. The characters don’t appear connected, other than their desolate settings. I am glad I was patient, because everything came together so spectacularly by the end that I couldn’t believe I was looking at the last page. The way the plot twists and tangles together is reminiscent of Cormac McCarthy’s No Country for Old Men, with characters on separate paths who manage to meet together dynamically by the book’s end. I’m anxious to read more of Donald Ray Pollock’s writing. Four and a half stars, no complaints at all.